Simple Green All-Purpose Cleaner/Degreaser is a non-toxic, biodegradable alternative to most cleaners, detergents and degreasers on the market now. Simple Green isn’t just safe, it’s strong, and one of the best ways to remove grease, grime, oil and lubricants from just about any washable surface. This powerful cleaner is concentrated, so a little goes a long way. You can also can custom dilute it depending on the cleaning task at hand. Simple green rinses easily, so there is no sticky residue left behind, just a sparkling clean surface. This all-purpose cleaner can be used for pressure washing, steam cleaning, maintenance, and parts washing. Since it is non-toxic it is also safe for use in food processing plants and food preparation areas. 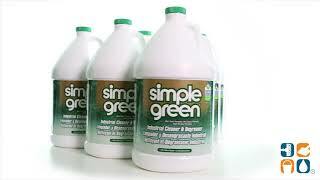 Simple Green All-Purpose Cleaner is an economic, safer alternative to hazardous chemicals and solvents. Get more for your money with Simple Green Degreaser today!